Following is a Press Release dated 12/07/11, from the ACLU of NM and other groups, to see orginal click here. Even though Nicolás told the officials that he was on the way back to Mexico, the agents removed him from the bus and placed him in deportation proceedings. The agents also confiscated four boxes and a suitcase that held Nicolás’s clothing, personal belongings, and trade tools he had purchased over the years. Two days later, he was able to recuperate the boxes with the help of the Centro de Derechos Humanos del Migrante, A.C. (CDHM) and the Humane Repatriation Program. However, the suitcase is still unaccounted for and no one has taken responsibility for its disappearance. Not having identification also makes it difficult for these individuals to prove their identity at interior checkpoints when attempting to return to their original hometowns in different parts of Mexico, creating a great deal of uncertainty and making them vulnerable to exploitation by local authorities or criminal elements while on their voyage. A Survey on Migration on the Northern Mexican Border, conducted by the Colegio de la Frontera Norte (COLEF), showed that the failure to return personal belongings to deported persons increased by 400 percent between 2007 and 2010, from 6,650 to 34,820 individuals. In the last four months, CDHM has restored personal belongings to 37 individuals were deported to Ciudad Juarez. Border Patrol agents issue a 30-day notice to detainees prior to the destruction of seized property. But if immigration officials hold an individual in a long-term detention facility or detainees face charges of illegal entry or illegal reentry, they may be unable to respond within 30 days and their personal property is destroyed. Also if the person has not been adequately informed about the 30-day limit, attempts to regain his or her possessions even one day late, results in lost belongings. Nicolás’s experience is also a disturbing example of Customs and Border Patrol’s questionable practice of boarding buses and trains in the interior of the United States and demanding “papers” from passengers. A recent report published by the New York Civil Liberties Union and other NY immigrant advocacy groups showed that between 2006 and 2009, most of the 2,743 people apprehended by CPB during sweeps of public transportation in New York bus and train stations were of Latino/Hispanic descent or people of color. NYU Immigrant Rights Clinic, the New York Civil Liberties Union and Families for Freedom. Yesterday at the state capitol hundreds of immigrant families, supporters as well as community and faith groups from across the state, rallied in Santa Fe to protest Governor Martinez' continued attack on immigrant workers and families, and to support driver's licenses for all residents of New Mexico. Carrying signs that said, "Public Safety Over Politics" and "Don't License Racism," participants included immigrants from over ten communities across the state as well as representatives from a coalition of organizations including Somos Un Pueblo Unido, the New Mexico Conference of Catholic Bishops, Engaging Latino Communities for Higher Education ( ), LULAC New Mexico, ABQ Partnership for Community Action, the League of Women Voters of New Mexico and the New Mexico Chapter of the National Association of Social Workers. "Why should New Mexico stop requiring immigrant drivers to be licensed and have insurance? Why wouldn't we want their records in a database available to law enforcement? It's a no-brainer," said Pablo Martínez, a New Mexico LULAC Board Member and retired law enforcement administrator. "This repeal effort isn't about what's good for New Mexico, it's a part of a larger political strategy to alienate Latino communities from Arizona to Alabama. New Mexico has worked hard to foster positive and respectful race relations since statehood, and we don't appreciate these outside ideologies based on the politics of hate." Marcela Díaz of Somos Un Pueblo Unido said the Governor's administration has repeatedly singled-out immigrants and created an environment of fear for immigrants and their families. "We're here today to show Governor Martinez that we stand united, and we refuse to be bullied and intimidated by her administration's tactics. It's integral to the safety of all New Mexicans for residents of New Mexico to be licensed and insured, and in coalition with dozens of faith and community groups across the state, we'll continue to advocate for that," Díaz said. In 2003, community and faith groups, victims' rights advocates, and law enforcement officials came together to promote a law allowing all residents of New Mexico, regardless of immigration status, to apply for a driver's license. Over the past eight years, about 80,000 foreign nationals have successfully applied, taken their eye, written and road exams, registered their vehicles and purchased auto insurance. In an effort to address legitimate concerns regarding fraud and abuse in the driver's license process, the Senate introduced and passed during the 2011 legislative session a better option for New Mexico than the proposed repeal of all foreign nationals driver's licenses. Governor Martinez did not sign the legislation into law, and has continued to push for repeal of the law during the current special session. Meredith Machen, Vice President of the League of Women Voters of New Mexico, said on Thursday, "In addition to supporting comprehensive immigration reform at the federal level, the League supports New Mexico's current system for drivers' licenses because it provides individuals with proper identification and increases public safety. We believe that New Mexico legislators need to focus on redistricting in the special session. Other agenda items are not relevant at this time." Somos Un Pueblo Unido is a statewide immigrant advocacy group that spearheaded the campaign in 2003 with law enforcement officials, victims' rights agencies, and faith and civil right group groups to require foreign nationals to apply for licenses, obtain insurance, and register their vehicles. Visit www.somosunpueblounido.org/DLNews for more information. You can friend Somos Un Pueblo Unido on Facebook. Yesterday, Senator Jeff Bingaman introduced legislation to increase the number of District Court judgeships in New Mexico to help the state deal with its heavy caseload. The bill is cosponsored by Senator Tom Udall, and would authorize new District Court judgeships for the southwest border states based on made by the Judicial Conference of the Federal Courts, which makes policy decisions for the U.S. courts. Under the bill, New Mexico would receive an additional permanent judgeship, allow for the conversion of an existing temporary judgeship to permanent and add a temporary judgeship. There are currently seven authorized judgeships for the district of New Mexico. “Over the last five years, we have significantly increased the number of Border Patrol agents, hired additional prosecutors and enhanced the presence of DEA, FBI and U.S. Marshal Agents throughout the border region. While this has greatly improved security in the border region, it has also put enormous pressure on the federal courts in handling the influx of cases,” Bingaman said. “It is critical that the federal judiciary has the resources and manpower it needs to dispose of cases in a timely manner and this bill would help District Courts in the southwest border states deal with this burden,” Bingaman concluded. “Additional resources for border patrol enforcement in New Mexico have increasingly meant higher case loads for our federal courts. This legislation would help ease that pressure by providing the manpower necessary to adjudicate cases in a timely manner that ensures justice for all involved,” Udall said. 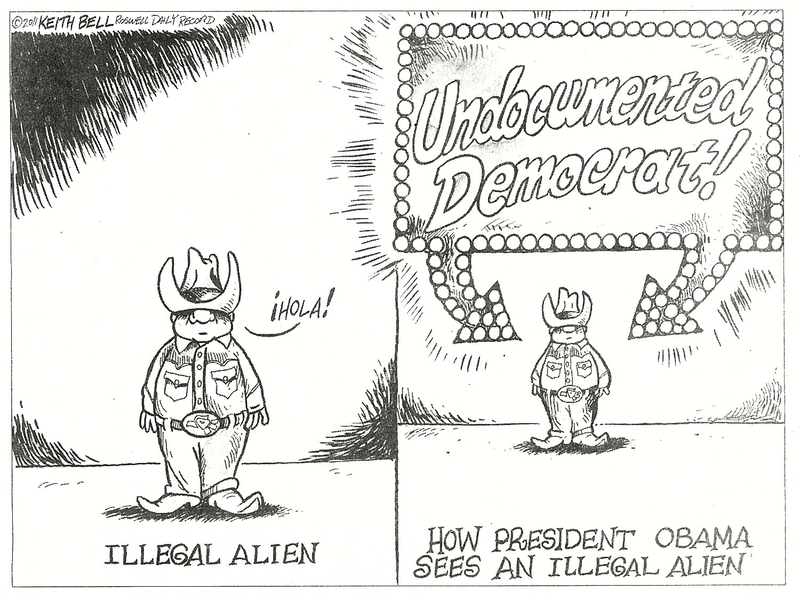 The following is a statement from Javier Gonzales, Chairman of the Democratic Party of New Mexico, on the political cartoon (click for image) published in yesterday's Roswell Daily Record. "Keith Bell's political cartoon that ran in yesterday's Roswell Daily Record clearly plays in to a racist stereotype which is offensive to anyone of Hispanic heritage. The Roswell Daily Record and Keith Bell must issue an apology for the racist cartoon." "As I have said before, the President understands that solving the immigration crisis requires not only a comprehensive approach which includes increased border security, but also a recognition of the millions of immigrants in the United States contributing daily to our economy. We must have a frank discussion to solve this problem, and this racist cartoon is an example of divisive and vitriolic politics too often used by Susana Martinez and the Republican Party." Click to read President Obama's remarks (pdf) on immigration made in El Paso yesterday. While the ACLU of New Mexico Regional Center for Border Rights is encouraged by President Obama’s remarks Tuesday putting immigration reform back on the table, concerns remain with the administration’s continued emphasis on a costly, enforcement-only model. Since 2003, border communities have witnessed a massive increase in federal law enforcement resources along the U.S.-Mexico border. According to the ACLU, there are now almost 10 border patrol agents per mile; thousands of other federal agents and members of the National Guard; 700 miles of fencing; and at least six drones patrolling our skies, costing taxpayers billions of dollars. The ACLU says this rapid over-intensification of federal law enforcement resources has come with little accountability and oversight and has resulted in negative consequences for people who live along the border. The ACLU-NM Regional Center for Border Rights has received increasing reports of racial profiling and harassment, particularly of Hispanic community members -- many of whom are U.S. citizens and have lived in the border region for generations. In addition, the Center has received several reports of undocumented individuals who did not receive needed medical attention or adequate food or water while in the custody of immigration officials. Since May 2010, there have been at least seven migrants who have been seriously injured or died as the result of being shot, tasered or beaten by Border Patrol agents. A large and emotional gathering of people from the borderland community joined together on Sunday at the Mesilla Community Center to show solidarity with marches scheduled for this week in Mexico against the drug war and violence south of the border. The event was sponsored by the Comite Amigos de Emilio, a borderlands community organization that supports granting asylum in the United States for exiled journalist Emilio Gutiérrez Soto. Ella Nelson of Las Cruces, the organizer, said the event and the committee's goal was to bring greater attention to the case of Gutiérrez and other victims of Mexico's bloodshed. The committee aims to put pressure on U.S. immigration authorities and Mexican officials, and demand action on Gutiérrez's and other asylum-seekers' human rights complaints. The emotionally charged gathering was keynoted by Mexican journalists Emilio Gutiérrez and Ricardo Chavez Aldana. Both men have been victims of the violence in Mexico and are seeking political asylum in the United States. Gutiérrez fled his town of Ascención, Chihuahua, in 2008 after writing a series of articles criticizing the Mexican army and receiving death threats from the military. Ricardo Chavez Aldana is a radio reporter from Juarez who received death threats and lost several family members who were murdered after he spoke out against the violence on the air in Mexico. Calling for peace and justice for Mexico, Gutiérrez laid the blame for the violence south of the border on the complicity of the Mexican military and the Calderon government, which he termed "illegitimate," rather than just on any outlaw cartel. "Because of the government policies, over 45,000 innocent people have died," Gutiérrez said. "There are at least 15,000 'disappeared' people, among them 68 journalists." "How many mother's have lost their children? How many children have been left orphaned? How many more are living in exile?" he asked. "It's a huge pain that we carry inside of us every day. The most painful thing about all this, for me, is the loss of my home and country," Gutiérrez said, "more sorrowful for me than the loss of my parents." Gutiérrez fled Mexico after receiving death threats from the military. A month earlier, more than fifty military personnel overran and illegally ransacked his home after he spoke out in the press against the violence. After fleeing Mexico with his son, Gutiérrez was detained for seven months by U.S. Immigration when he arrived at the border seeking asylum last June. He is currently staying in Las Cruces while his case is pending in the courts. Ricardo Chavez Aldana, a radio newsman who is also living in exile, also addressed the rally. Chavez Aldana's nephews were murdered after he spoke out on the radio against the violence in Juarez and criticized the military. "Juarez is a dead city," he said. "Four of every five businesses have closed down, and we see blood everywhere." Ruben Garcia, the Director of Annunciation House, a shelter in El Paso, recounted the stories of some of those who have sought refuge in his facility, including a mother who has lost four of her five children. "There is a mistaken idea in most of America, promoted by politicians, that one place end and another one begins at a certain line. We need to be mindful of role that the drug trade in America is having on Mexico" Garcia said. "I've heard these stories many times. Im sorry for being emotional" said a tearful Ella Nelson, "but on this Mother's Day, I hope we will take a moment to think about the mothers who have lost their families in this crisis." For more posts by Stephen Jones, visit our archive.